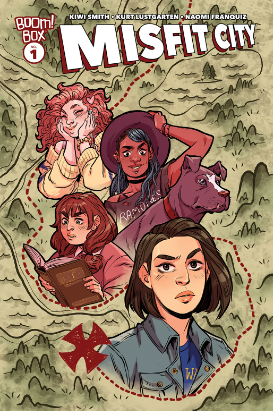 New comic series Misfit City sets out to recapture the oddball charms of 80s kids' adventure movies (specifically, The Goonies), but my favorite thing about this story is the way it depicts living in a real town that's best known as a nostalgia-driven tourist trap. Misfit City is co-written by Kirsten “Kiwi” Smith (best known as the screenwriter for Legally Blonde) and Kurt Lustgarten, and illustrated by Naomi Franquiz. It's set in a small town called Cannon Cove—clearly inspired by Astoria, Oregon, where The Goonies was filmed, along with several other movies—and features a largely female cast of likable, diverse characters. When Wilder and her friends stumble upon a long-lost pirate map, they are determined to hunt down the missing treasure, no matter who stands in their way. As someone who has spent a lot of time in Astoria, I found Misfit City particularly charming. The authors get the town's mixture of industry—while geographically isolated, Astoria is a major canning and shipping center—and touristy charm exactly right. I was less impressed by the cartoonish art style (although the characters are easily distinguishable, which is nice) and the treasure-hunting storyline, which hinges upon a series of spectacular coincidences, but I'm happy to stick around for the three-dimensional female characters, lively sense of humor, and genuinely awesome setting.